Mapped using the Natural Communities layer from MASS GIS. Coastal sandplain grasslands, also referred to as maritime grasslands, New England sandplain grasslands, or terrestrial medium tall graminoid vegetation, are low-lying habitats that are dominated by grasses, and occur throughout much of coastal New England. This habitat has been shaped over time by a unique glacial history, maritime climate, and periodic disturbances such as fire and salt spray 7,13. Soils in this habitat are comprised of sandy loam, typically nutrient poor and well-drained 13. Common grasses include little blue stem, hairgrass, Pennsylvania sedge, and poverty grass 5,11. Sandplain grasslands host a number of uncommon plants and animals, such as bushy rockrose and short-eared owls 2,6. Sandplain grassland habitat increased in extent with the clearing of pitch pine-oak forests during European settlement, which began in the early 1600s, and by 1850, nearly half of coastal Massachusetts sandplain habitat was converted to agriculture 6,9. Soil alterations from farming stimulate growth of non-native shrubs and threaten the re-establishment of native plant species 4,10. Sandplain grasslands border heathland and shrubland habitats, which are found further inland and at higher elevations, but are often intermixed with grasslands 11. Pre-colonial sandplain grasslands were naturally maintained through salt, wind, and fire exposure 7,13; today, they are further maintained by prescribed burns and mowing 12, although these activities may be decreasing 4. Fires were historically prevalent in coastal New England sandplains, and were known to be used by Native Americans, which likely contributed to the maintenance and expansion of coastal grasslands 9. 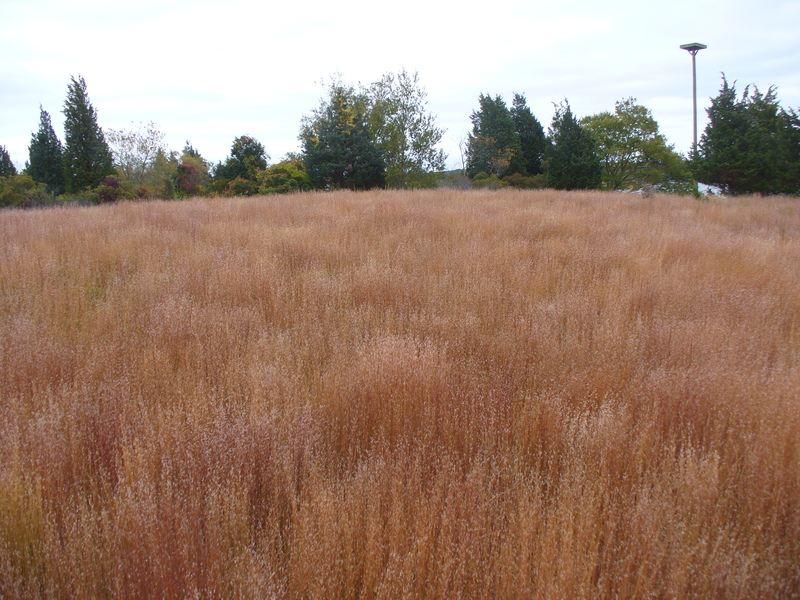 Coastal sandplain grasslands are currently listed as “Critically Imperiled” by the state of Massachusetts 11. Additionally, Massachusetts has identified 71 Species of Greatest Conservation Need (SGCN) that occur in grassland habitats 8. Rising sea levels will likely impact coastal plain grasslands. Salt water intrusion and increasing storm surge may inundate coastal grasslands and disrupt native vegetation. On the other hand, this habitat has the ability to adapt by migrating inland, as long as it can continue to be maintained by salt spray, wind, and fire exposure, and is not outpaced by the rate of sea level rise 1,7,13. The importance of fire in these ecosystems may have declined as a result of wetter climate conditions due to increasing precipitation 12. Future changes in precipitation will effect the relative survival of native and non-native grasses, which will create both challenges and opportunities for adaptive management 3. Additional stressors such as development, agricultural runoff, and invasive species will also compound the effects of warming temperatures, increasing precipitation, and rising sea level. 1. Ashton, A., J. Donnelly, and R. Evans. 2007. A Discussion of the Potential Impacts of Climate Change on the Shorelines of the Northeastern USA. Prepared for the Northeast Climate Impacts Assessment, Union of Concerned Scientists, Woods Hole Oceanographic Institution, Woods Hole, MA. 2. Askins, R.A., F. Chavez-Ramirez, B.C. Dale, C.A. Haas, J.R. Herkert, F.L. Knope, and P.D. Vickery. 2007. Conservation of Grassland Birds in North America: Understanding Ecological Processes in Different Regions. Ornithological monographs 64:1-46. 3. Bakker, J.D., S.D. Wilson, J.M. Christian, X. Li, L.G. Ambrose, and J. Waddington. 2003. Contingency of Grassland Restoration on Year, Site, and Competition from Introduced Grasses. Ecological Applications 13:137-153. 4. Briggs, J.M., A.K. Knapp, J.M. Blair, J.L. Heisler, G.A. Hoch, M.S. Lett, and J.K. McCarron. 2005. An Ecosystem in Transition: Causes and Consequences of the Conversion of Mesic Grassland to Shrubland. Bioscience 55:243-254. 5. Dunwiddie, P.W, R.E. Zaremba, K.A. Harper. 1996. A classification of coastal heathlands and sandplain grasslands in Massachusetts. Rhodora 98:117-145. 6. Eberhardt, R.W., D.R. Foster, G. Motzkin, and B. Hall. 2003. Conservation of changing landscapes: vegetation and land-use history of Cape Cod National Seashore. Ecological Applications 13:68-84. 7. Griffiths, M.E., and C.M. Orians. 2004. Salt spray effects on forest succession in rare coastal sandplain heathlands: evidence from field surveys and Pinus rigida transplant experiments. Journal of the Torrey Botanical Society 131:23-31. 8. [MA SWAP] Massachusetts Division of Fisheries and Wildlife. 2015. Massachusetts State Wildlife Action Plan 2015. Westborough, MA. 9. Motzkin, G., and D.R. Foster. 2002. Grasslands, heathlands and shrublands in coastal New England: historical interpretations and approaches to conservation. Journal of Biogeography 29:1569-1590. 10. Neill, C., M.M. Wheeler, E. Loucks, A. Weiler, B.V. Holle, M. Pelikan, and T. Chase. 2015. Influence of soil properties on coastal sandplain grassland establishment on former agricultural fields. Restoration Ecology 23:531-538. 11. [NHESP] Natural Heritage Endangered Species Program. Sandplain Grassland S1. 2010. Massachusetts Division of Fisheries and Wildlife. Available at: http://www.mass.gov/eea/docs/dfg/nhesp/natural-communities-facts/sandpla.... Accessed 3/19/2016. GIS layers shown online. 12. Parshall, T., D.R. Foster, E. Faison, D. Macdonald, and C.S. Hansen. 2003. Long-term history of vegetation and fire in pitch pine-oak forests on Cape Cod, Massachusetts. Ecology 84:736-748. 13. Stevens, A. 1996. The paleoecology of coastal sandplain grasslands on Martha's Vineyard, Massachusetts. Doctoral Dissertations Available from Proquest. Paper AAI9709659.